Do you need to wear an ugly Christmas sweater to a party this year? 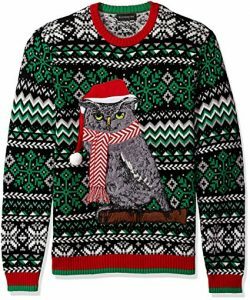 On Amazon today you can save up to 50% off ugly Christmas sweaters! You can get this hilarious Blizzard Bay Men’s Festive Owl Crew Neck Ugly Xmas, Blue/Red Combo, XL for just $17.99 – a 40% savings! This will ship free with Amazon Prime or qualifies for free Super Saver Shipping with a $25 purchase. Previous post: Gift Guide for Campers | 20 Amazing Gift Ideas!